THE BEADY EYE’S UNPUBLISHED BOOK. CHAPTER TWENTY. SECTION FOUR. Heading north to Gonder Ethiopians capital for two hundred and fifty years (1636-1864) dawn is still without its Ethiopian sun. 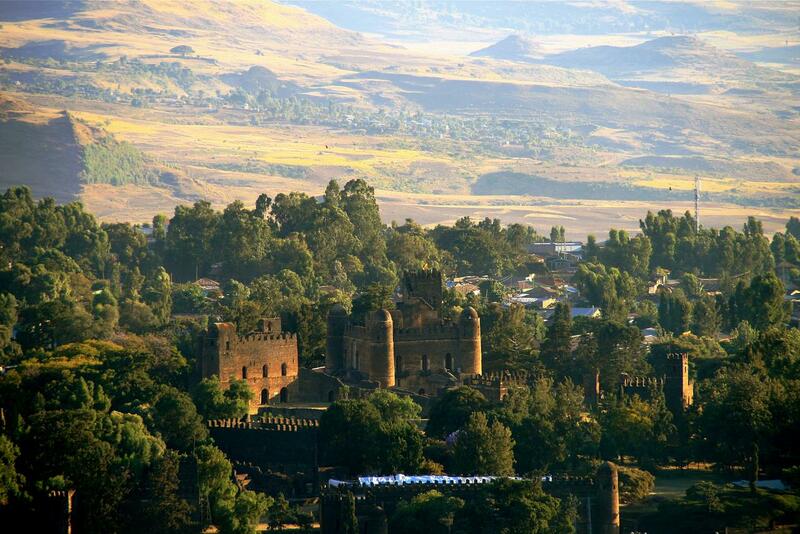 Described, as Africa’s Camelot, Gonder is one of the high lights of any Ethiopia trip. The province, which Gonder takes it name, was the centre of Ethiopia’s religious power struggles. The Moslems lead by Imam Ahmec Ibn Ibrahim Al Ghazi or Graqn (left handed) for short from Harer and Emperor Libne Dingel who sent a messenger to Portugal for help were the main combatants. History has it that the Portuguese lead by the son of Vaso da Gama (Admiral of the Indian Ocean he being the first European to reach India by sea) took over six years to arrive to give Emperor Dingel a hand. By the time the Portuguese arrived to team up with Empress Seble Wangel and Libne Dingle son Gelawdeos (Dingle had snuffed it). They gave Left hand such a bashing that he was carried off on a stretcher. Left hand peeved with his humiliation got on this mobile and gave an old Turkish Sultan a text for help. The Sultan came up trumps. Left hand now known as no hands returned to wipe out most of the Portuguese and Ethiopians at the battle of Wafla. Poor Vaso da Gama son Christopher lost his head in the brawl. The Empress Wangel and the remaining Portuguese scampered up the Semien Mountains to meet Emperor Gelawdewos who as you can image was mightily pissed off. So in February 1543 at Wynadega near Lake Tana accompanied by a few of his buddies they wiped out what was left of no hands. Christianity was once again established in Ethiopia. However the story does not end there. Unknown to the Emperor well hack’s wife Dil Wombera survived Wynadega. She married Nur Majahad Mir of Harrer (he is the bloke who built the Harrer Wall (Jogel) a nephew of what was left of left hand. Anyway she got Nur on the wedding alter to take a vow to revenge her husband’s death. Emperor Gelawdewos by this time was rightly miffed so with a small army he rushed off to Shewa where Nur and the new wife had being trying for five years to overrun. Against all advice and UN resolutions number minus 6500 Gleawdewos rushed in on Good Friday only to get shot in the head. His head ended up on a pole for public exhibition in Harer. If you are still with me what was left of him was buried in Tedbabe Mariam Church in Wollo with all honour. The church itself was built back in 327 A.D by the twin Emperors Abraha and Atsbeha whom in those times were busy building rock-hewn churches. You might well ask how we came to learn all of this. Before leaving Lake Tana we had picked up in the Tourist Office some leaflets. Believe that and you believe all. Lake Tana recedes into our memories as we pass through Azezo. The surrounding land is fast becoming the foothill of the Simien Mountains. At one point we descend a winding section of tar laid road that has the first undulating tar corrugations we have come across in Africa. We cross one small highly cultivated valley after another. Gonder nestling in its own valley eventually shows itself domineered by Fasiladas castle. No sound came from it. No whirling wisp of smoke. It seemed to hover in a state of exhaustion from its past glory and was yet stabilized by the surrounding large trees and lust vegetation. The Castle reputedly designed by an Indian architect, displayed elements of Mogul, Moorish and European influence. Round tower at each of its corners look out over the surrounding country. Constructed of ruddy volcanic stone and blond brown sandstone, it indeed looked like Camelot but with a mixture of elements from a maharajah’s palace in Rajastan, or a renaissance Florentine stronghold or a medieval castle in the south of France. On entering town centre one is immediately aware that there is a strong Italian influence to Gonder construction. We check into the Hotel Fagera a Mussolini type villa. Wooden floors, cornices ceilings, large spacious bedrooms with central wobbling ceiling fan and cracked shower tiles. We eventually surface under a boiling sun for a day of exploration. Arriving at the gates to the Royal Enclosure it is surprisingly guide free. However entering for a mere five bucks it is straight way evident that unlike Tis Abay Falls this place needs a knowledgeable guide. Asking at the gate one appears like a gene. Using our parrot guide avoidance techniques we are satisfied that our guide has a good command of English. For the next six hours we wander around the enclosure containing five crenulated castles with inter connected tunnels and raised walkways. We enter Fasil castle the centrepiece. Not much to look at inside but its size gives an idea of old Fasil power. Large dining area with a reception room on the ground floor above it another large room, which according to the guide was used for religious services, and addressing the faithful. Up another flight of stairs the bedroom and watchtower. From here you can see Lake Tana on a good day said the guide. Florence is bored till we pass some lion cages. Haile Selasi kept a black–mane lion here till 1992 say the guide. In flashes of seconds we pass from one Emperor to the next. Tasdiku Yohannis I (1667-82) – Iyasu I (1682-1706) – Dawit III (1716-21) – Bakaffa (1721-30) – Iyasu II (1730-55) – world war two bombs. Yohannis Castle is a heap of rubble damaged by an earth tremor and a bomb. Iyasu Castle described by Charles Poncet a French 17th century who was summoned to Gondor by Emperor Iyasu to treat him and his son for Leprosy was covered in gold leaf, and ivory. Iyasu liked throwing lavish do’s with a mere thirteen thousand of his soldiers in full battle dress just in case of the odd gatecrasher. Dawit III built the lion cages. He ended up being poisoned. His brother Bakafa built a castle with a large Banqueting hall. His son Iyasu II built the last castle in the enclosure in honour of his mother Mentuab who caused untold trouble with her Catholic tendencies. The whole lot of castles are augmented by, swimming pools, saunas, stables, and concert halls. For a full portrayal of the life style that existed in Gondar one would have to read Poncet rare but extremely in depth account of his visit. A small extract to get a feel of what life was like goes somewhat like this. I take a quick detoured on the way back to town out to the church of The Abbey of the light of trinity or Debre Birhan Selassie to give it proper Amharic name. 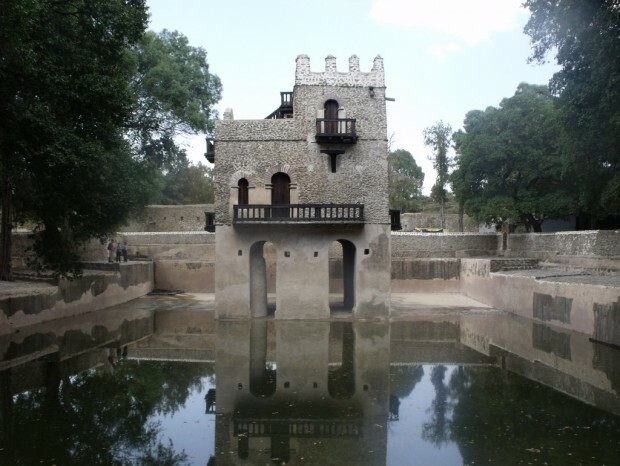 Built by Iyasu I Fasil grandson it is one of Ethiopia most famous churches. Saved from destruction by the Dervish of Sudan as legend has it by a swarm of bees it is the church with the ceiling of little angel faces so often reproduced in Ethiopian tourist propaganda. Noting the opening time in the morning I return to the girls. After dinner with the girls long gone asleep I ponder the hotels three-book collection in the bar. After Iyaus II along came Emperor Loas (1755-70) He teamed up with a bloke called Ras Sihul Mikael to squash a small rebellion. These two blocks feel out with each other when the Emperor Loas had the leader of the rebellion Ras Yemariam Bariyaw tortured and killed against the wished of Mikael > This lead to Loas hiring a contract killer to bump of Mikeal while he was playing a game of Chess in the Royal Enclosure. The Killed missed with the enviable results Mikeal put a match too Loas Palace. Flushed him out, dumped him in prison till he had him strangled with a sash. Mikeal then released all the little princes that the big bad Emperor Loas had locked up in Wohi Amba. He appointed Lyasu the great, Abeito (Prince) Yohaanes as Emperor the first of his Puppet Emperors and thus started eighty-five years of political turmoil called “ Zemene Massafint” or era of Princes. This period brings us up to 1855 when along came Kassa later known as Emperor Tewodros. For thirteen years, this boy-o set about to restore unity. He built roads and a large cannon called Sevastopol. He suggested to Queen Victoria that they should team up against the Turkish. Because his messenger came back with no reply he locked up the British Consul along with any other Europeans he could find. On getting wind of this Queen Vic sent a friendly letter. It unfortunately took a year and a half to arrive only to be wrongly interpreted. The Queens Royal postman was put in the slammer with the rest. Queen Vic got her knickers in a twist when she heard this. Not to be messed with she sent 32,000 marines under Captain Robert Napier to get back her messenger and release the other. Emperor Tewodros committed Harry Harry rather than surrender to Napier (1868). As to what happened to the letter no one knows or is telling. Mission completed I can only presume Napier did not hang about as there is no further mention of him. Emperor Tekle Giorgis was known previously as Wagshum Gobeze of Wag and Lasta succeeded Tewodros. He lasted three years ending up in jail after being captured by his brother in law Dejazmatch Bezbiz Kassa who crowned him self Yohannes IV. This fellow was not to be messed with. Annihilating Turco-Egyptians armies on two occasions instructing those that we left to walk home without shoes and to wash their feet as the left Ethiopia just in case any of it soil was stuck to their feet. The treaty of Wuchallie was signed by Menelik of Shewa (1889-1913) he becoming Emperor after Yohannes IV. Article three of the treaty gave the Italians a foothold in the Ethiopian highlands and Article XV11 in Italian text gave Italy control over the foreign affairs of Ethiopia and made her a protectorate under Italy. The Amharic version of Article XV11 of course said no such thing. Alor! Another battle this time east of Aksum see’s off the Italians but leaves the Eritrea problem to this day. Menelik goes on to establish Addis Ababa with his wife Taitu who named it Addis Ababa “New Flower.” They introduced electrical light, the telephone, the postage stamp, schools, hospitals, and the railway to Djibouti. From Menelik 1 to Menelik 11 stretches a period of 3000 years or 237 Emperor’s one of which only lasted six hours. A dynasty leading back to the Queen of Saba with a further 97 sovereigns going back a further five thousand years. It’s no wonder that Ethiopia is one of the oldest Independent countries in the world. DONATION NEWS. THERE MUST BE ONE SYMPATHETIC SOUL. Robert Dillon. Account no 62259189. Ulster Bank 33 College Green Dublin 2.